PARIS -- PSA/Peugeot-Citroen plans 1.5 billion euros ($1.98 billion) in asset sales, including a stake in its Gefco trucking unit, after a shrinking auto market caused profit to drop. Earnings before interest, taxes and one-time gains or costs fell to 1.32 billion euros in 2011 from 1.8 billion euros a year earlier, Paris-based PSA said in a statement Wednesday. Sales at Europe's second-biggest carmaker after Volkswagen Group rose 6.9 percent to 59.9 billion euros. The manufacturer, whose carmaking division missed a target of breaking even in 2011, said it will sell property as well as a holding in Gefco that has yet to be determined. The disposals include the Citer vehicle-rental unit that PSA sold to U.S.-based Enterprise Holdings Inc. on Feb. 1 for 440 million euros. "Asset disposals are a double-edged sword -- giving up future earnings to secure the balance sheet today," David Arnold, a sales specialist at Credit Suisse in London, said in a note to clients. PSA is the first in Europe's car industry to take such a step "to stabilize its balance sheet going into a very tough operating environment in 2012." PSA's stock jumped as much as 4.5 percent to 15.80 euros and was up 2.7 percent at 9:18 CET in Paris. That pared the shares' decline in the last 12 months to 48 percent, valuing PSA at 3.63 billion euros. The stock is the worst performer on the 14-company Euro Stoxx Automobiles & Parts Index in the past year. The French company has "made no decision on the size of our continuing stake in Gefco," though it intends to remain a "long-term strategic partner," PSA Chief Financial Officer Jean-Baptiste de Chatillon said on a conference call with journalists, declining to rule out the manufacturer becoming a minority shareholder. Property sales will generate about 500 million euros for PSA, Chatillon said. The company's deliveries fell 1.5 percent to 3.5 million vehicles in 2011. The decline was led by a drop in Europe, where industry figures show Germany was the only country to expand among the region's top five car markets. "We expect market conditions to remain difficult in Europe in 2012," CEO Philippe Varin said in the statement. The French company laid out a program in October to eliminate as many as 6,000 jobs in Europe in 2012 to help reduce costs by 800 million euros. PSA said Wednesday that it increased the savings to 1 billion euros, with reductions in investments and marketing costs contributing. Chatillon told journalists that no jobs were affected by the additional cuts. Net debt widened to 3.4 billion euros from 2.9 billion euros a year earlier, and from 1.6 billion euros on June 30. "Net debt increased more than expected, so it definitely makes sense to focus on improving liquidity," Marc-Rene Tonn, a Hamburg-based analyst at Warburg Research with a "hold" recommendation on PSA stock, said by phone. "The cost- savings program is also certainly important, but PSA tends to jump from program to program, and so far that has not been successful." Earnings as a proportion of sales fell to 2.2 percent in 2011 from a 3.2 percent operating margin a year earlier. Net income dropped to 588 million euros from 1.13 billion euros a year earlier, less than the 711 million-euro average of 19 analyst estimates. 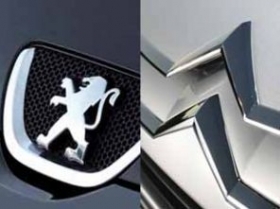 The car-manufacturing unit, which builds the Peugeot 208 hatchback and Citroen C4 sedan, reported a recurring operating loss of 92 million euros, compared with profit of 621 million euros in 2010. PSA had predicted in October that the division would about break even on that basis, versus an earlier forecast of positive earnings, because of growing pressure to cut prices. A loss of about 500 million euros in the second half was attributable to "the major market declines in southern Europe, where we are very present, the pressure on prices in the small- vehicles segment and disruption in the logistics chain," including the effects of the earthquake and nuclear crisis in Japan earlier in the year, Chatillon said. Gefco's recurring operating profit rose 13 percent to 223 million euros, and sales increased at the same pace to 3.78 billion euros. Operating profit at PSA's publicly traded Faurecia car-parts division rose 43 percent to 651 million euros, the unit said Feb. 8. The sale of a stake in Gefco makes sense as its profitability makes it more attractive to investors, Warburg's Tonn said. The region's auto-manufacturers' association, which reports figures for European Union countries plus Switzerland, Norway and Iceland, said Jan. 17 that PSA's sales in that market fell 8.8 percent in 2011. PSA said in January that its deliveries in Europe declined 6.8 percent, including sales in future EU member Croatia.